Digital elevation models of Antarctic bed topography are smoothed and interpolated onto low-resolution ( > 1 km) grids as current observed topography data are generally sparsely and unevenly sampled. This issue has potential implications for numerical simulations of ice-sheet dynamics, especially in regions prone to instability where detailed knowledge of the topography, including fine-scale roughness, is required. 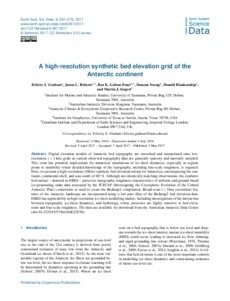 Here, we present a high-resolution (100 m) synthetic bed elevation terrain for Antarctica, encompassing the continent, continental shelf, and seas south of 60° S. Although not identically matching observations, the synthetic bed surface – denoted as HRES – preserves topographic roughness characteristics of airborne and ground-based ice-penetrating radar data measured by the ICECAP (Investigating the Cryospheric Evolution of the Central Antarctic Plate) consortium or used to create the Bedmap1 compilation. Broad-scale ( > 5 km resolution) features of the Antarctic landscape are incorporated using a low-pass filter of the Bedmap2 bed elevation data. HRES has applicability in high-resolution ice-sheet modelling studies, including investigations of the interaction between topography, ice-sheet dynamics, and hydrology, where processes are highly sensitive to bed elevations and fine-scale roughness. The data are available for download from the Australian Antarctic Data Centre (doi:10.4225/15/57464ADE22F50).